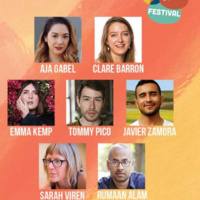 The 7th Annual New Voices Festival, a celebration of emerging writers, is taking place Wed., April 17th to Fri., April 19th. Choose Your Own Adventure: What does it mean to identify as a writer? This panel will be moderated by IC Economics Professor Jen Tennant and will feature writers: Sarah Viren, Clare Barron, Javier Zamora, and Aja Gabel. Citizen-Scribes: Is all writing a political act? This panel will be moderated by IC Writing major Margaret McKinnis and will feature writers: Emma Kemp, Rumaan Alam, Tommy Pico, and Javier Zamora. "Is It a Love Story? ": A live performance where music, theatre, and literature meet. Inspired by the works of our New Voices Authors, IC musicians will perform original music compositions alongside students from the Theatre Department. Special thanks to IC students Kyra Skye and Lucia Vecchio for their collaborative efforts on this event. Individuals who would like to request accessibility accommodations should contact ehenderson@ithaca.edu. We ask that requests be made as soon as possible to ensure they can be met.